Did you ever expect your first professional win would come at a major, and the Women’s British Open of all events? Given how long I’ve gone without a win, I’ve been joking for a while that it wouldn’t surprise that my first one would come at a major. 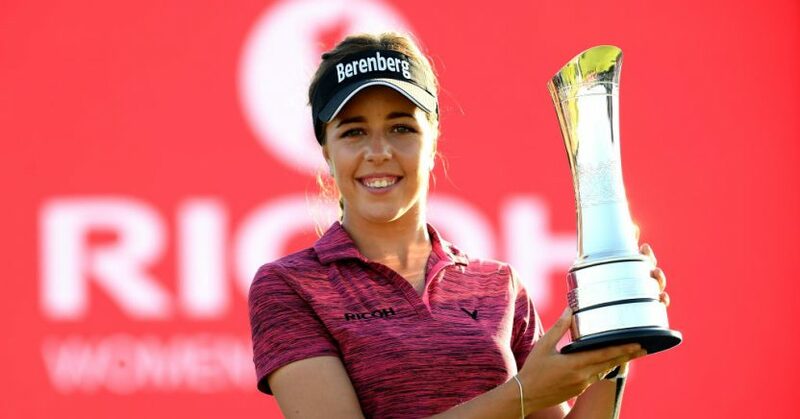 To win on the European Tour or the LPGA Tour is one thing, but to win a major against the best players in the world is on another level altogether. I think that must bring out the best in me. Ever since I started out in the game, when I was seven or so, I’ve always dreamed of having the chance to win the Open – you know, ‘this one’s to win the Open’ – when you’re practicing your putting, so to have my first win be at the Open is incredible. At what point did you think you could win? I arrived at Lytham feeling pretty confident. I love links golf, and I thrive on the home support. I had finished third last year, and felt in good form, so I knew that if everything fell into place I had a chance. But, honestly, it wasn’t until I hit my second shot into 18 on Sunday that I felt like I had it under control. Despite having a three-shot lead, I knew that I still had to close it out on what is one of the toughest finishing holes in golf. I couldn’t even hit an iron off the tee for safety, as there were bunkers in the way, so I had to hit a 3-wood. It was a tough pin to get at, as well. Walking up to the green, I told my dad that I’d be happy to take a three-putt here, and I did. I thought I would cry, but I just managed to hold it together there. So I was very happy to walk off with a bogey and close it out. You looked really calm all week, and especially on Sunday, but what were you feeling on the inside? Honestly, I felt more nervous during the third round than I did during the final round. And I didn’t feel that many nerves on Sunday until the 18th. The whole week was incredible. I had so much support from the crowds, and to hear my name being cheered gave me a huge lift. I’m just so grateful to everyone who came out to support me. It must have been a special moment to walk down the fairway with your dad, after all you’ve been through together. What did you say to each other? It was amazing to have dad caddie for me and be there with me, but we didn’t say much, to be honest. I was checking I actually had a three-shot lead, in case the scoreboard was wrong or something! What was the key to your success at Lytham? I think I managed my game really well. At the start of the week, dad and I made a conscious decision to try and stay out of the fairway bunkers, which are basically a one-shot penalty at Lytham. So I laid up on a lot of par fours and fives to avoid the trouble, and relied on my long irons and fairway woods to get onto the green. Lytham is quite a long course, but I just had to convince myself that as long as I was on the fairway, then at least I’d get a shot to the green. I think I went in seven greenside bunkers all week and managed to get up-and-down every time, so I was really pleased with that. So, while I had some long shots into some of the greens, I was confident enough in my short game that I would be able to limit the damage. I also had a good week with the putter, which always helps, but I still felt like I left a lot of putts out there. You’ve spoken about the times you were unable to play in majors that you had qualified for due to lack of money. Did those missed opportunities make you even more hungry to make up lost time? I want to back up the win, and prove that it wasn’t just a one-off; so, of course, I’ll be looking to win tournaments, and, hopefully, to win some more majors. I came second at the Portland Classic on the LPGA Tour two weeks after the Open, so I was pleased to be able to pull out another good performance so soon after the win. I didn’t want to win a major and then miss a cut or something, so that was pleasing. I’m now just kind of relaxed and focused on enjoying the rest of the events this year. Further down the line, I’d obviously like to get to world No.1 – I’m up to eighth now, I think – but for now I’m just concentrating on carrying on playing well and enjoying my golf. How has your life change since the win? It’s changed in the sense that I’m British Open champion, and a lot more people know who I am. I think as a person I’m still the same, and I think I’ll remain the same even if I win ten more. That’s the main thing for me.